Boxing is one of the hardest sports in competition, going 12 rounds at high intensities whilst trying to not get hit by your opponent. However, many boxers say that fighting is the easiest part of the job! It’s the training camp and making weight in preparation for fight night that takes its toll. Pro boxers can train over 20 hours per week. It’s no surprise then, that they seek out recovery strategies to help cope with the training load. It seems boxers have used a number of different recovery methods. The most popular is cold-immersion – commonly used in the form of ice baths and cryotherapy chambers. But are these effective recovery tools for boxers? Have you seen the videos of athletes freezing their bits off in an ice chamber? This method is called cCryotherapy. Athletes enter individual sized chambers that exposes them to extreme temperatures of -130 degrees centigrade for 2 to 3 minutes. 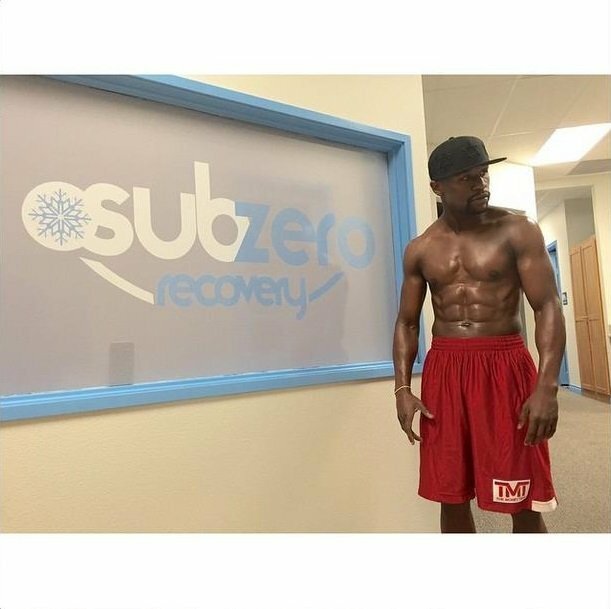 There’s not a great deal of scientific evidence supporting cryotherapy. Despite this, it’s used by major sports clubs in football, rugby and American football to relieve pain and reduce inflammation. Humans can only tolerate 2 to 3 minutes of being exposed to these sub-zero temperatures, so what can happen if you go 5 minutes? The worst but least common cases can be hypothermia and even death (someone died in a chamber). Justin Gatlin (the American sprinter) got frostbite when using the chamber due to his damp socks freezing instantly. Too much exposure can also cause a decreased muscle temperature, which could result in injury, risk of tripping stumbling due to immediate reduction in neural control. Want to risk this with a big fight coming up? Cryotherapy could be beneficial when under high-intensity training, however should not be used too often. There is a mixed bag of results in the research, in which it seems to be based on individual perceptions. However we must ask ourselves, is the £50 per session with the associated risks and the little subjective reward worth it? If you’re looking for a cheaper and safer way for cold-immersion recovery, Ice baths maybe a better option. In a recent episode of sky sports behind the ropes, we saw Carl Frampton taking what looked like a horrendous ice-filled water-bath. In fact, it looked like he hated it. So much so, he immediately jumped in a hot shower afterwards to warm-up. You’ve probably heard about or even seen elite athletes taking these ice baths. But just because elite athletes seem to do it doesn’t make it elite practice. The common held (and outdated) theory for taking an ice-bath is that it causes vasoconstriction, stimulates venous return and aids metabolite removal after exercise. The physiological responses to ice-baths are more complex than this and distilling the theory down to this level is not helpful at all. Still, several pieces of scientific research have investigated whether cold-water immersion can improve subjective ratings of muscle soreness. The consensus is that cold-water immersion after muscle damaging exercise does improve feelings of soreness. That is athletes feel less sore after cold water baths. But, there are caveats. The effect severe cold water immersion (between 5 and 10°C) on muscle soreness, (I think we can assume that Frampton’s ice-bath was about below 10°C judging by his reaction), is unclear – some find it helpful others don’t. Yet, when the temperature of water increases to between 11 and 15°C there is a clear beneficial effect on the perception of muscle soreness. That is people feel less sore. So do boxers need to go so cold? No. He’s likely going to get better results if the temperature is warmer. The immersion time is also important. There’s obviously a good relationship between water temperature and tolerable immersion time. The research indicates immersion times between 5 and 15 min as most beneficial. So, if the water is too cold, then tolerance time will decrease. Then you’ll be missing both the time-frame of effectiveness and the optimal temperature. These studies all investigated the perception of muscle soreness, which is clearly individual. So if you think that cold water immersion will speed your recovery, it probably will. But, as we always say, there’s a time and place for everything. The skill is knowing when that place is. You see it’s probably not a sensible thing to jump in a cold bath after every training session. Especially if your sport requires strength, a sport like boxing. Two pieces of research published in the last few years have indicated that we need to re-think how athletes use cold water immersion. Both these studies suggest that strength training adaptations are blunted if cold water immersion is used frequently. So they might actually be doing more harm than good because strength gains are likely slowed by the use of cold water immersion. So, do we recommend cold water immersion? No. We believe that we can get better adaptions from the intelligent management of training load. We stress athletes when they need overloading, and we let the body manage recovery. Obviously, we encourage mobility work during recovery but this is different to altering biochemical signalling pathways responsible for muscle hypertrophy, as is the case with cold water immersion. Want to know more about Sport Science for Boxing? Alan is a physiologist at Sheffield Hallam University with a wealth of experience in sport science. He has has worked with a range of individual athletes and teams, including FIFA World Cup referee Howard Webb and Commonwealth games medalists England Table Tennis. Alan has worked extensively within Boxing at the highest level, having a huge influence on Kid Galahad’s British, Commonwealth and European Title wins and most recently Kell Brook’s IBF welterweight world title victory. Alan is a BASES accredited sport & exercise scientist, doctoral researcher and one of the UK’s first chartered scientists in sport science. Alan will be throwing some knowledge bombs into Boxing Science drawing on his experiences of working in sport at the highest level.